Contributed by Dan Fuoco, Airframe Service Sales Rep. Deciding whether the melted lens maintenance headache is worth the cost of the cure depends on how much the issue impacts your operation. Photo courtesy of LoPresti and Jose Gibert. It’s common knowledge that the original equipment landing lights can be a frequent source of frustration for Hawker operators. If left on for too long, heat buildup from inside the lens can cause the lenses to melt. Filament lamp technology was a standard for Hawker aircraft until a few years ago, when a mercury/xenon gas lamp was developed by LoPresti. These “BoomBeam” landing lights are now standard equipment for newer, out-of-production Hawker aircraft. Filament lamp technology is prone to overheating, vibration and shock. Customers have reported that lens melting can begin after only a few minutes of operation. After several melting events, the problem will become very noticeable. The lens will begin to look discolored, and over time the lens contour can become physically distorted. 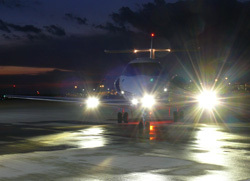 To repair or replace a landing light lens can be costly. Some lenses, if still within limits, can be overhauled while others will need to be replaced. The only way to avoid these issues entirely is by switching to the new lamp technology. The LoPresti Hawker BoomBeam landing light kit won’t overheat, is more resistant to vibration and shock, and is much brighter. However, the upgrade also costs around $16,000 and takes about five days to complete. It consists of a power supply, shielded high-voltage wire harness, plug-in HID lamp, mounting hardware and lens reflector assemblies. Deciding whether the maintenance headache is worth the cost of the cure depends on how much the inconvenience impacts your operation. Those who have them love them, but if you can limit the use of landing lights to only a few minutes and don’t mind an occasional replacement, it might serve your interests just as effectively. Dan Fuoco is an Airframe Service Sales Rep. at Duncan Aviation's Lincoln, Neb. (LNK) facility, and specializes in airframe services for Citation and Hawker aircraft. He began working in aviation in 1974.